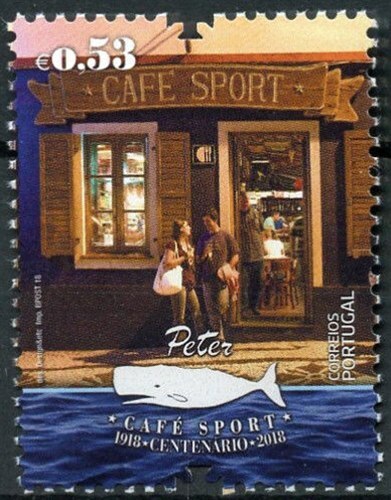 Portugal issued four stamps and a miniature sheet for “Café Sport” in Horta, Azores, and one stamp has some ship models on it, while the MS shows pages of a visitor’s book which shows a sailing yacht. In the beginning of my seaman’s career (late 1950s) the ships stayed in port for a long time and you had time to go onshore, in the end loading and discharging were going so fast, you did not have any time for shore leave, or the berth was so far from town that it took many hours to reach it. I have never made a call at Horta, many times passing it. 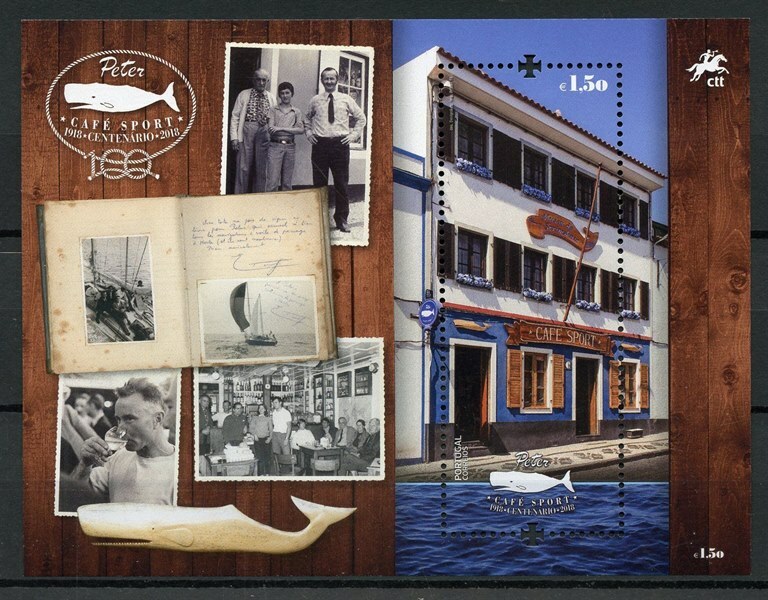 Café Sport was well known by the early sailors but I think not many seamen are visiting it today and this bars are mostly visited by tourist and crews of visiting yachts. Something as comforting as a gin and tonic and a knowing smile in the middle of the Atlantic. It is more than that, of course. But if you ask someone to say the first thing that comes into their head when you mention Peter Café, in Horta, it isn’t hard to see how easily such a pleasant image becomes embedded. This vision becomes clearer as, like a boat ploughing through the ocean towards terra firma, we begin to hear the many tales of intimacy and spiritual comfort. Like the story of the origin of the name of one of the most charismatic establishments in Portugal. 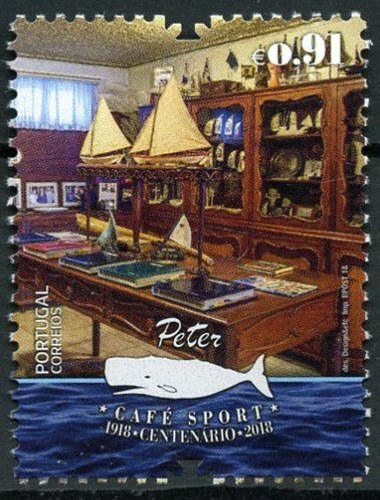 Peter was the nickname given, in 1943, to José Azevedo (1925-2005), son of the owner of the Café Sport, Henrique de Azevedo, by the commander of the Royal Navy’s H.M.S. LUSITANIA II (ex HMS CHANTICLEER built 1942), a way for the Briton to evoke the son he missed at home. The ship had anchored there in 1939, after having been hit by a depth bomb. The obliging boy who ran errands captivated the British crew. The name stuck and quickly spread around the island. It was in 1918 that Henrique de Azevedo (1895-1975) opened the Café Sport, which still operates in the same building today, on Rua Tenente Valadim, moving the business established 17 years earlier by his father from the building next door. 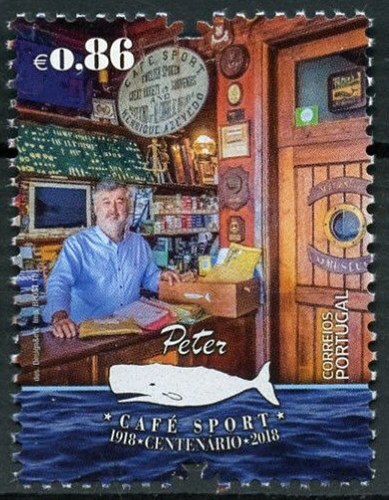 In 1901, Ernesto Lourenço S. Azevedo (1859-1931) established what could be considered the direct predecessor of the current Peter Café, when he opened, a stone’s throw from the harbour of Horta, the Azorean House, a varied enterprise, which added food and drink to the sale of traditional products of the region. Embroidery, lace, hats and wicker baskets, feather flowers and ‘embroidery anglaise’ were items that the family was already selling in the Bazar of Fayal Manufactures & Products, on Largo do Infante. In 1888, the products shown at the Industrial Exhibition in Lisbon were awarded a distinction. But the true cosmopolitan vocation of the shop came from its location. Horta was a strategic port for shipping fleets crossing the North Atlantic, among them those of the four foreign companies that chose the island of Faial as a base for planting their undersea cables. 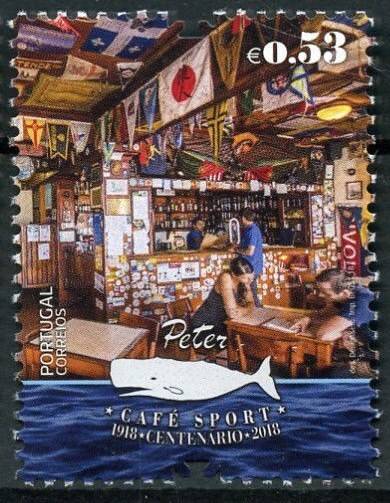 This international spirit had always had an influence on the Café Sport, starting with the name – a direct reflection of the passion for sports cultivated by Henrique Azevedo, a footballer, rower and billiards player. This attitude revealed the British influence, as was the case with his particular fondness for gin and tonic, a drink that would become one of the symbols of the establishment. It was thanks to English clients that the spirit came to be sold there. The development of this taste even led, years later, to the local production of tonic water, since discontinued. The British sailors were excellent at enlivening the space, drinking, smoking, playing cards and dominos and fraternizing with the natives of Faial, people known for being easy to deal with and possessing a universal appeal. The Dutch joined them, from 1921, when they established a tug base to help the vessels of their fleet in case of difficulties in the oceanic immensity. It was the Dutch who donated the blue and black paints, used in the maintenance of their boats, which came to adorn the outside of the café. But, like the British, they were also decisive in shaping the spirit of the interior, which, from the 1950s, began to mature when the development of yachting gave a definitive boost to the popularity of Peter Café, which, since the start of the 20th century, had been the place where much of sailors’ correspondence was sent, a convenience known as poste restante. More recent is the Peter Museum, opened in 1986 by José Henrique (b.1959), son of the man who made the café famous. In this upstairs space, there is an unparalleled collection of scrimshaw art, engravings and paintings on whale teeth. This is something that can be appreciated by all, including the sailors arriving in Horta on 18 June 2018, as part of the commemorative regatta for the centenary of the Café Sport, held in partnership with the Ocean Cruising Club. Portugal 2018 0.53/0.91 Euro and MS 1.50 Euro sg?, scott?